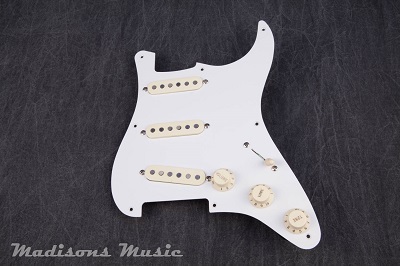 1980 Fullerton Style Stratocaster pickguard. Genuine Fender pickguard and acc. package. The guard is pre wired with a set of Crystal Clear Fullerton Red Bobbin pickups. Crystal Clear Pickups are vintage ispired and hand wound. Demo's available. The wiring harness has upgraded matched CTS pots, switcraft switch and a 50's C-D repro capacitor. Overall this is a very specific piece perfect for a restoration or project. Easy drop in ready, will come with wiring diagram and input jack.